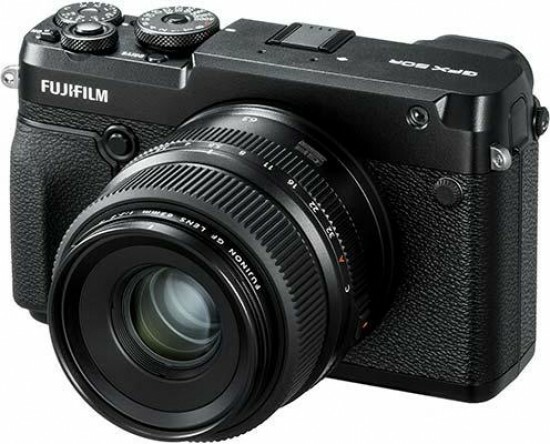 The Fujifilm GFX 50R is a rangefinder-style mirrorless camera with a 51.4 megapixel, 43.8mm x 32.9mm medium-format CMOS sensor. The GFX 50R is smaller, lighter and cheaper than the original GFX 50S camera that was introduced back in 2016 - it's 25mm thinner, 145g lighter, and costs £1K/$1K less than the 50S. 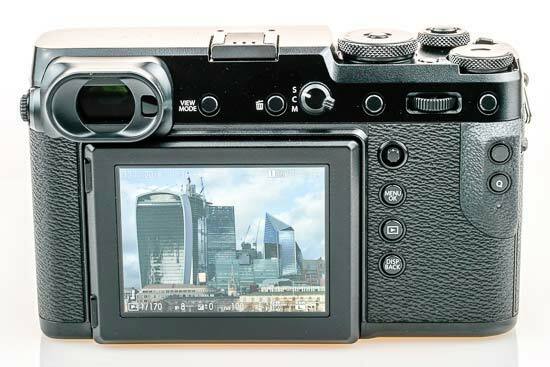 It actually most closely resembles the X-E3 APS-C camera in its revised control layout, which we'll discuss in more detail in the Ease of Use section below. The GFX 50R and 50S share exactly the same image sensor, X-Processor Pro image processor, battery, film simulation modes and electronic viewfinder. The GFX 50R differs from its larger sibling in three main ways - it has a tilting, rather than three-way, LCD screen, a lower magnification viewfinder (0.77x versus 0.85x), and includes Bluetooth connectivity for the first time on a GFX camera. Otherwise the key specifications remain the same - Raw images with 14-bit color depth and 14 stops of dynamic range, ISO range of 50-102400, 1080p video with a frame rate of 30fps, 3fps continuous shooting, contrast-detection autofocus system with 117 points, shutter speeds from 60 minutes to 1/4000th sec using the mechanical focal plane shutter or up to 1/16000 sec via the electronic shutter, a 3.69m-dot OLED electronic viewfinder, a 3.2" 2.36m-dot touchscreen LCD, dual UHS-II SD memory card slots, built-in Wi-Fi for remote connection, and interval shooting and multiple exposure modes. The recommended retail price of the Fujifilm GFX 50R is £3999 / $4499 body only in the UK and USA respectively. Whereas the GFX 50S had a DSLR, X-T series like design, the new GFX 50R sports a rangefinder style that's strongly reminiscent of both classic film cameras from the past, such as the GA645 and GF670, and of the company's most recent rangefinder-esque mirrorless camera, the X-E3. Subsequently, one of the main reasons for choosing the GFX 50R instead of the 50S is the position of its electronic viewfinder, now located to the far left of the body when looking from the rear, rather than in the middle. This is to allow you to switch between looking through the viewfinder with your right eye and watching your subject with your left eye, thereby making it easier to anticipate where the subject will enter the frame, which is perfect for street photography. If you're trying to decide between these two specific Fujifilm medium-format cameras, you really owe it to yourself to try out both side-by-side, as the viewing method is so different. We can't tell you which one is better than the other, as it really comes down to personal preference, just as some Fuji users prefer the rangefinder-esque X-Pro/X-E cameras and some the DLSR-like X-T range. There are two differences between the viewfinders of the 50R and 50S, though. The GFX 50R has a lower magnification viewfinder, 0.77x versus 0.85x, and the GFX 50S has a viewfinder that can actually be completely removed, whereas the one on the 50R is fixed in place. Another important point of difference between the two models is the smaller size and lower weight of the GFX 50R when compared with the 50S - 25mm in depth and 145g in weight, to be precise - making it better suited to life outside the studio, which is where most medium-format cameras spend their days. This reduction in size and weight makes the GFX 50R much more comparable to the the Hasselblad X1D-50c, a similarly styled rangefinder camera which uses exactly the same medium-format sensor as the 50S and 50R. At 775g and 160.7mm (W) x 96.5mm (H) x 66.4mm (D), the Fuji 50R is still not exactly a small camera though, requiring both hands at most times for operation. You can hold it one-handed for a short period of time, but it quickly becomes uncomfortable even with the smallest GF lens mounted. 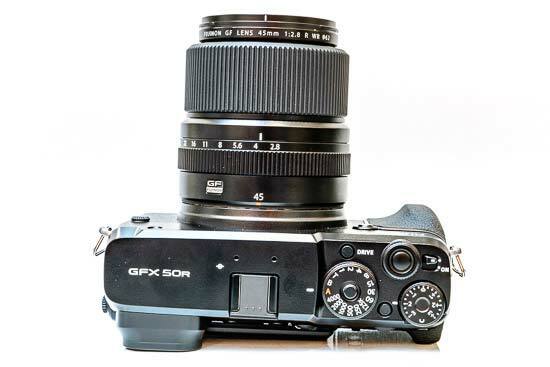 Next year's launch of the diminutive GF 50mm F3.5 'pancake' lens will go some way to solving that issue. What it won't address is the rather small hand-grip on the front of the GFX 50R. 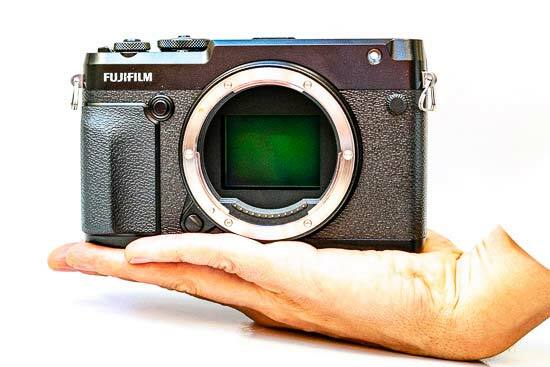 We'd have preferred a larger, more prominent grip, especially as Fujifilm have decided not to release an optional battery grip for the 50R (there are no electrical contacts on the bottom of the camera body). There will inevitably be some third-party solutions, but at launch the grip on the 50R is a little too small and shallow for our absolute liking, especially when using the largest GFX lenses. In the meantime, we'd advise using a wrist-strap with the GFX 50R, just for additional peace of mind. 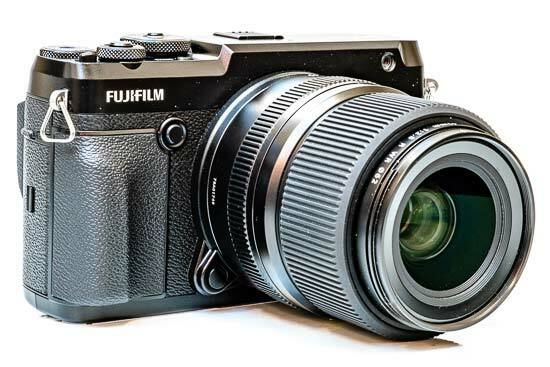 The Fujifilm GFX 50R is equipped with a 43.8x32.9mm CMOS sensor with a resolution of 51.4 megapixels and no optical low pass filter that delivers 8256x6192 pixel still images. The sensor is essentially the same as the one found in the Fujifilm GFX 50S and Hasselblad X1D cameras. 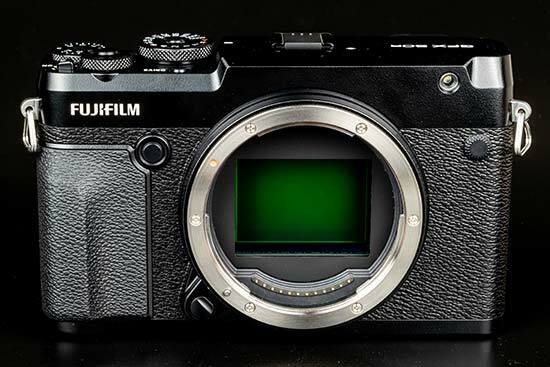 This chip has an imaging area that's 1.7x greater than that of a 35mm "full-frame" sensor, and over 3.7 times larger than the APS-C sized sensors used in Fujifilm's X-series cameras. Unlike those cameras, though, the Fujifilm GFX 50R has a traditional Bayer colour filter array in front of the sensor. The pixel count isn't really higher than that of the highest-resolution 35mm full-frame DSLRs – the Canon EOS 5DS and 5DS R – but the pixel pitch is greater, promising a wider dynamic range and a better signal-to-noise ratio. The GFX 50R is once again a very well-built camera, with absolutely no flex or movement in its chassis thanks to the die-cast magnesium alloy body and machined control dials. It's also dust-resistant, water-resistant and freeze-resistant down to -10°C, making this a medium format camera that can be used outside as well as indoors. We tested the GFX 50R with the GF 23mm f/4, 45mm f/2.8, 63mm f/2.8 and 110mm f/2 lenses, which all feature a focal-plane shutter, allowing for shutter speeds as fast as 1/4000th of a second. Each lens also has an aperture ring and a C (Command) position on the ring to enable aperture adjustments via a command dial on the camera body. All the lenses boast the same dust- and weather-resistant construction as the body, and because of the mirrorless construction of the camera, these Fujinon G lenses have a very short flange-back distance of only 26.7 millimetres. With its focal-plane mechanical shutter, the GFX 50R has a top shutter-speed limit of 1/4000th second in all shooting modes. This allows you to select a faster aperture even in bright conditions or when shooting with flash during the day, although there's no built-in ND filter. The GFX also has an electronic shutter in addition to the mechanical one, which provides a much faster top shutter speed of 1/16,000th second. This allows you to continue shooting wide-open with fast aperture lenses in the brightest of conditions without having to resort to fitting a glass ND filter or using external flash and lights. There are some important caveats with the electronic shutter - the ISO range is restricted to 100-12800 and you can't use an external flashgun, but overall it's a great feature that makes the GFX more versatile. 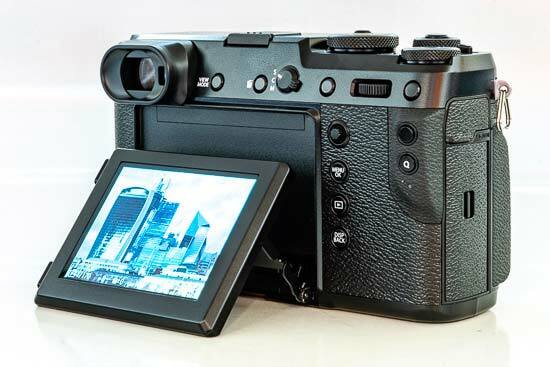 The LCD screen is another main point of difference between the 50R and the 50S. On the latter, the screen can be tilted up and down by about 90 degrees when in landscape mode and also upwards when shooting in portrait mode via a simple press of a button on the side. On the 50R, it can only be tilted up and down in landscape mode, reducing the complexity of the mechanism (and therefore its cost) but also its versatility too. The size of the rear LCD screen is 3.2-inches and the resolution is an impressive 2.36m-dots, bigger and much more detailed than the screen on the Hasselblad X1D. The Fujifilm GFX 50R has an intuitive touchscreen interface, allowing you to either move the AF point, or simultaneously move the AF point and focus on the subject. On the right hand side of the screen you’ll see a small icon which allows you to choose between using the screen to set the AF point or to have it focus as well. If you prefer, you can turn off this functionality altogether, but it is quicker than using the joystick to set the AF point. One drawback to leaving the touchscreen AF on is that we kept inadvertently moving the AF point when changing lenses. In image playback, you can simply drag left and right to go through the sequence of images and pinch/double-tap to zoom in and out, although you can't use the main menu system via the touchscreen (you can use the Q Menu though). One operational aspect that the new GFX 50R does improve on is the welcome inclusion of a dedicated exposure compensation dial, something that was omitted on the GFX 50S to make room for a top-panel LCD. In turn, though, you don't get the useful LCD screen or a dedicated ISO speed dial on the smaller 50R, so it's something of swings and roundabouts here. There's also a large a shutter speed dial with its own locking pin in the centre to prevent it from being inadvertently moved, with settings ranging from 1 second to 1/4000th second, an Auto option, a T setting for longer exposures (2 to 30 seconds, set via the circular command wheel) and a Bulb mode for exposures up to a whopping 60 minutes in length. 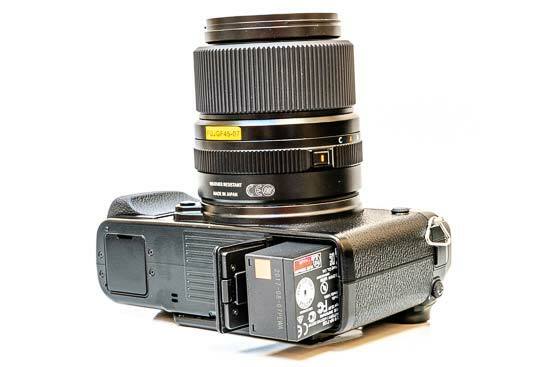 There is a vacant hotshoe for an accessory flash on top of the camera offering full compatibility with Fujifilm's flash units, but as expected there's no built-in pop-up flash. The flash sync speed is still a disappointingly slow 1/125 second, just like on the 50S. You can get around this limitation by using the optional EF-X500 or any compatible third party studio flash which supports FP mode, which then allows the flash sync to be as fast as 1/4000sec. Completing the top of the camera is the Drive button for setting bracketing, burst and multiple exposure, a small unmarked Function button (which sets the ISO speed by default), the front control dial that surrounds the shutter release button, and an awkwardly placed On/Off switch that we didn't particularly like because of its position, but which at least is difficult to turn on by accident. The Fujifilm GFX 50R turns on almost instantly, unlike the Hasselblad X1D. Squeeze the shutter release button in single shot mode to take a maximum resolution image and the screen almost instantly displays the resultant image. Although the 3fps continuous shooting speed won't impress either mirrorless or DSLR users, it is actually pretty fast for a medium format camera. The GFX 50R offers exactly the same basic video mode as the 50S, rather inconveniently accessed via the Drive button on top of the camera (it's the last option in the list), that supports either Full HD (1920x1080 pixels) or 720p recording at 29.97, 25, 24, and 23.98 fps in the H.264 compressed MP4 format. 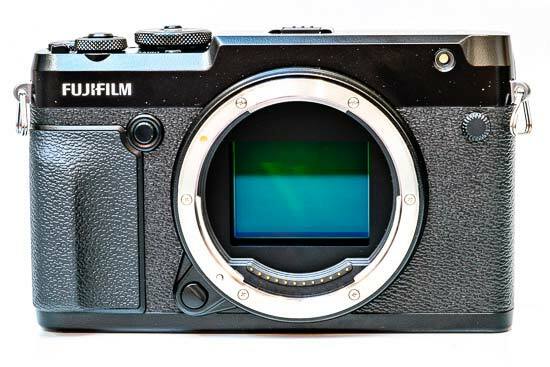 The GFX doesn't benefit from any of the video improvements that Fujifilm have made to the X-T3 - it would have been nice to see Eterna added to the film simulation modes, for example. The final key feature difference between the two GFX models is the introduction of Bluetooth connectivity for the first time on the 50R, a feature that X-series users have enjoyed for a couple of years now. It works in exactly the same way as on recent X-cameras like the X-T3. You can use this feature to connect the GFX 50S R to a smartphone, even when the camera is turned off, and automatically transfer images from the camera for easier backup, or more probably quickly sharing them via your social network of choice. The GFX 50R features exactly the same built-in wi-fi connectivity as the 50S camera. Install the Fujifilm Camera Remote App and you can transfer your pictures immediately to a smartphone or tablet PC and then edit and share them as you wish, transfer stills and video onto the camera, and embed GPS information in your shots from your smartphone. You can also control the camera remotely, with the list of available functions including Touch AF, shutter release for stills and movies, shutter speed, aperture, exposure compensation, ISO sensitivity, Film Simulation modes, White Balance, macro, timer and flash. The built-in wi-fi also provides a simple means to backup your photos to your home PC. 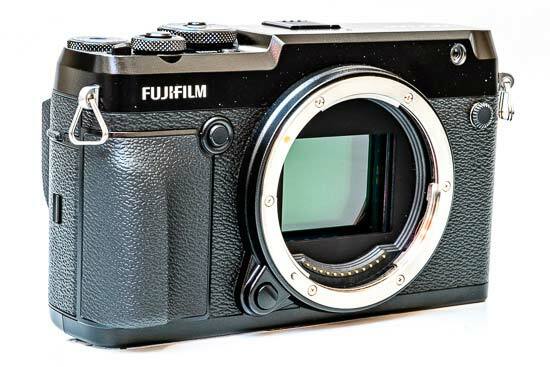 The GFX 50R is strikingly similar to the Fujifilm X-E3 APS-C camera in terms of its control layout, and, despite the size increase, will feel immediately familiar to anyone who's used those particular Fujifilm mirrorless cameras before. The main design decision is the removal of a traditional 4-way controller on the rear of the camera. Instead, the GFX 50R relies more on its Touch Function feature, which effectively replaces the physical D-Pad that has been completely removed from the camera. You can flick left, right, up or down to activate various pre-assigned functions, like changing the white balance or picking a film simulation. In practice, it's a little trickier to use than a physical control, but maybe that's simply because we're more used to the latter than the former. Furthermore, you can actually change the focus point whilst holding the camera up to your eye by dragging across the touchscreen with your right thumb. Again, it's a little tricky to get it right at first, but persevere and it soon becomes more natural, if not quite second nature. The rear of the GFX 50S looks strikingly similar to the X-E3. There's a vertical column of four controls on the right-hand side of the LCD screen, with the Focus Lever, or joystick, at the top. First introduced on the X-Pro2 and then the X-T2 cameras, as with the touchscreen drag feature, the rear joystick lets you change the focus point whilst holding the camera up to your eye - in practice, we preferred using the joystick to do this rather than the touchscreen. Above the LCD screen and to the right of the viewfinder are controls for changing the View Mode, deleting images, setting the focus mode (Single, Continuous and Manual), an unmarked Fn3 button that by default toggles the Exposure Lock on and off, the rear control dial, and another unmarked Fn4 button that by default toggles the Auto-focus Lock on and off. The two unmarked Function buttons are just two of 11 different controls that can be customised to suite your way of working, also including the Drive button and Fn1 button on top of the camera (the latter accesses the ISO menu by default), Fn2 on the front, and and Fn5 on the rear thumb-rest, which acts as a back button AF control. You can also change what happens when you swipe up, down, left and right on the touchscreen and also when you press the rear control dial (by default this checks the focus). All of this potential customisability can be a little overwhelming at first, but once you've configured everything to your particular way of working, it proves to be a great way of making the camera fit your needs, rather than the other way around. Something that we feel should have been addressed, though, is the actual size of the controls, and how flush they are with the camera body - they're a bit too small, smooth and recessed to find quickly, especially given just how big the camera is. We'd have preferred slightly larger controls, especially the various round buttons, and also with a textured surface and slight protrusion from the body too. The tiny Quick Menu button is set into the prominent rear thumb rest. This provides quick access to lots of frequently used shooting settings including the ISO speed, White Balance, File Size and File Quality, with either the focus lever or the 4-way controller and the command dial used to quickly change them. The Fujifilm GFX 50R has the same contrast-detect type autofocus system as the 50S, with no phase-detection AF sensors embedded in the sensor as on the X-T3, X-H1 and X-Pro2 cameras. Depending on the lighting conditions, this makes the GFX both a little on the slow side to auto-focus, often taking about 1/2 second to lock on to the subject, and also prone to hunting in low-light environments. As well as single-point AF, the GFX 50R offers Zone and Wide/Tracking modes which utilise the larger /425-point area to capture moving subjects. In Zone mode, you can select a 3x3, 5x5 or 7x7 zone out of the 425-point AF area. During AF-C focus, the GFX continually tracks the subject, positioning it at the centre of the zone. The Wide/Tracking mode combines the Wide mode (during AF-S), in which the GFX automatically identifies and tracks the area in focus across the 425 point AF area, and the predictive Tracking mode (during AF-C), which uses the entire 425-point area to continue tracking the subject. This feature enables continuous focusing on a subject that is moving up and down, left and right or towards and away from the camera. Manual focus is also provided, and very good it is too. As you'd expect, the manual focus rings on both the lenses have a lovely feel, and two different focusing aids are provided - auto magnification and focus peaking. In conjunction with the high-resolution electronic viewfinder, we found it very easy to accurately determine critical sharpness. You can use the Focus Lever joystick to move the AF point to one of the 117 different points that cover most of the frame. The size of the AF point can be set to one of six different options via the rear control dial to achieve more precise focusing, and you can also simply tap on the touchscreen to set the AF point virtually anywhere within the frame.. If you want even finer control, you can select the 425 points AF menu option which splits the same area of the frame into a 17x25 grid of much smaller AF points. The right hand flank of the GFX 50R features a metal lug for attaching a strap, with a matching one on the left, underneath which are a compartment for the HDMI port and then dual memory card slots housed inside a weather-proof compartment. The GFX 50R offers compatibility with Ultra High Speed UHS-II SDXC memory cards, which has the main benefit of increasing the data writing speed in continuous mode to about twice that of a conventional UHS-1 card. The GFX 50R offers a continuous shooting rate of 3fps for 13 JPEGs or 8 compressed Raw files if you use a UHS-II SDXC card and the electronic shutter, making it one of the fastest medium format cameras on the market. If you prefer to use the mechanical shutter, the rate drops to 1.8fps for unlimited JPEGs or 8 Raws. On the left is a small compartment with for the now combined 2.5mm headphone port and microphone port. There's also an X-sync socket on the front of GFX 50R. 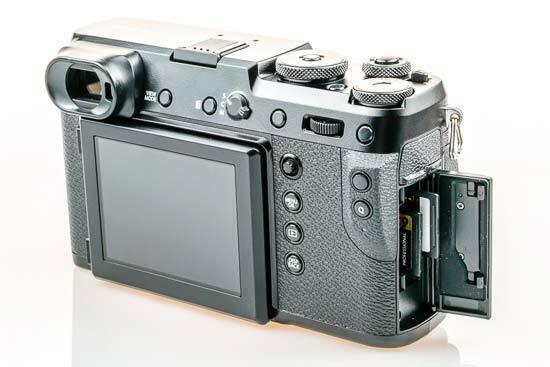 The base of the Fujifilm GFX 50R features the large battery compartment for the same NP-T125 battery as used by the 50S, which is pretty good at around 400 shots, a screw tripod thread that's inline with the centre of the lens mount, and rather strangely a covered compartment housing the USB 3.1 Type-C port (which no longer supports Fujifilm's Remote Release RR-90) and DC In 15V connector. Note that the 50R doesn't have a headphone jack, unlike the 50S.